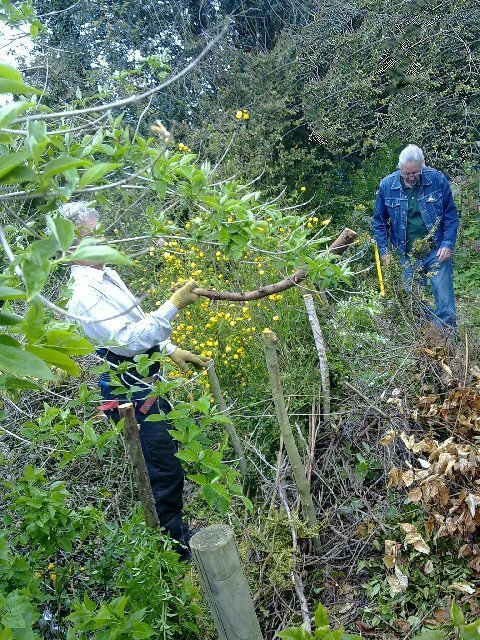 Our 4th annual Give and Grow at the Community Library garden on 20th May held particular significance this year in the light of the recently passed EU “Plant Reproductive Material Law” aiming to regulate and restrict the sale, exchange or growth of all plants unless officially registered. This would have impacted severely upon our freedom to (legally) “Give and Grow” in the manner of even our humble SB events, had the law not been mitigated in the final hour due to pressure from growers, gardeners and lovers of plants and freedom from all over Europe. See The Real Seed Catalogue’s page for more information and why we need to keep an eye on this law (and take a look at their great vegetable seed list, too). 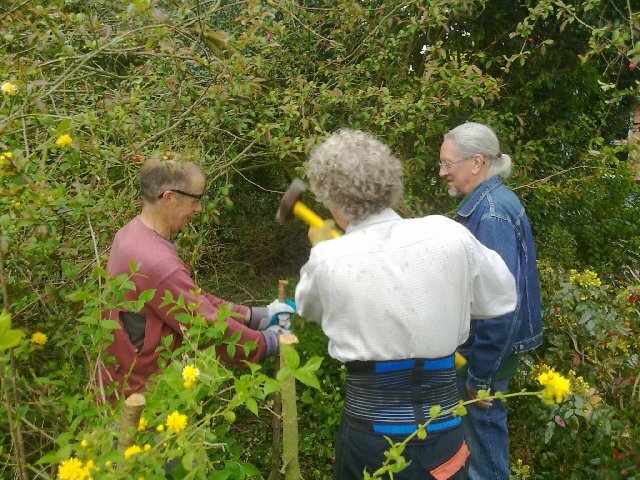 Thanks especially to Nick and Lesley for organising it, and to everyone who helped out and brought (and took) plants and seeds. 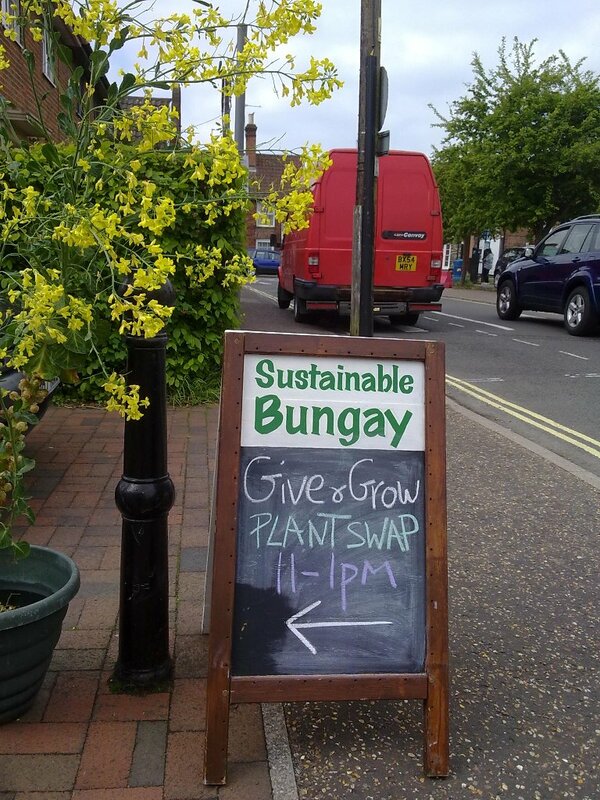 Don’t forget to pop in to the library and check out the permanent plant swap table, and feel free to take the plants and/or give some. Don’t be shy on either count. If you could label the plants you bring that would be great! 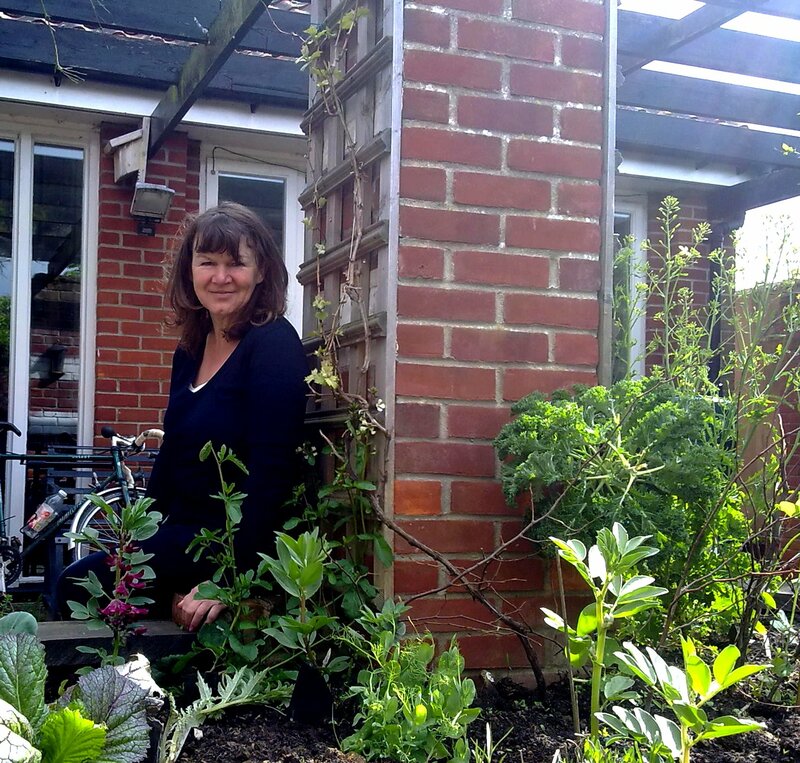 Lesley Hartley, who is curating this year’s Edible Bed in the centre of the library garden. Note the crimson flowered broad bean to Lesley’s left. 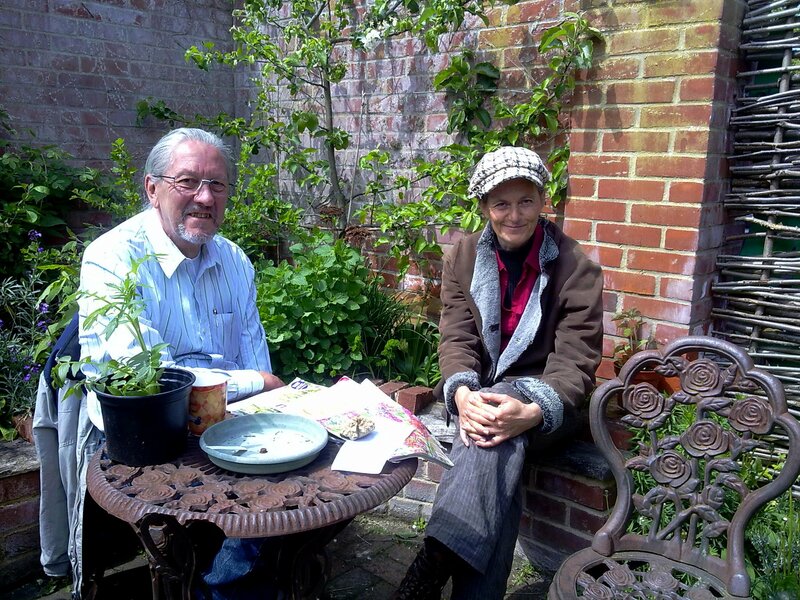 After a slow post-cold-winter start, the garden is beginning to respond to Lesley’s hard work. 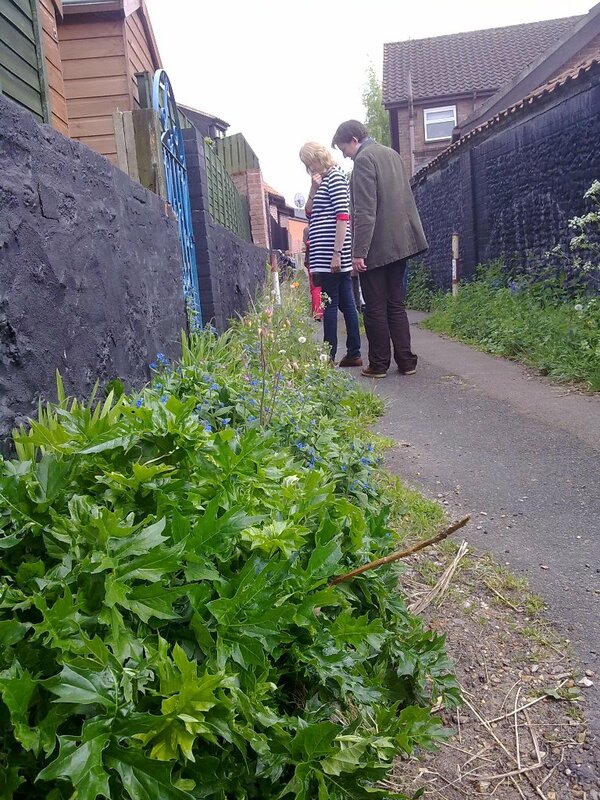 Plant Medicine 2012 meets Edible Bed 2013. Mark and Lesley trying not to hide behind flowering brussels. What was that about Brussels and plants… keep giving and growing?!? Brussels, A-Board and the big old red Post Office van, which Eloise has picked up all the large Give and Take day furniture and garden donations in over the last three years and used to deliver items to people after the events. 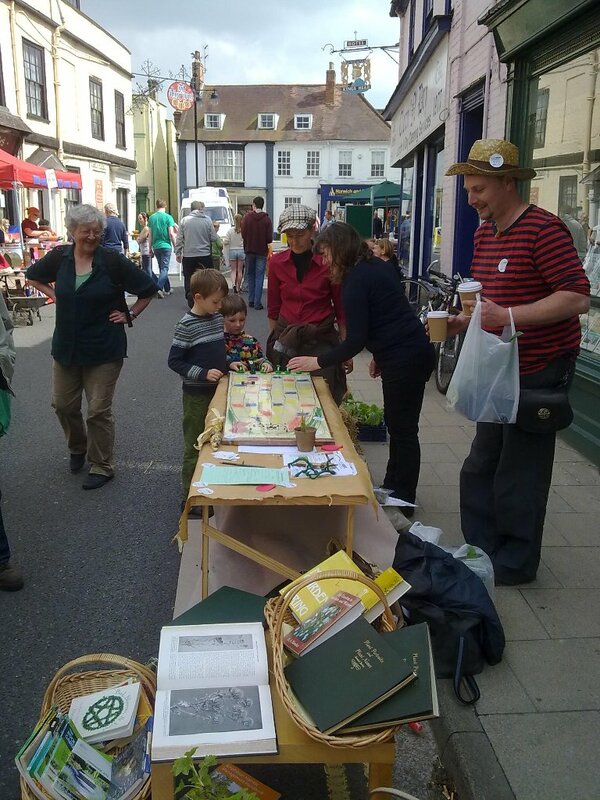 As well as couriering display boards for Bee group events and other talks and workshops. 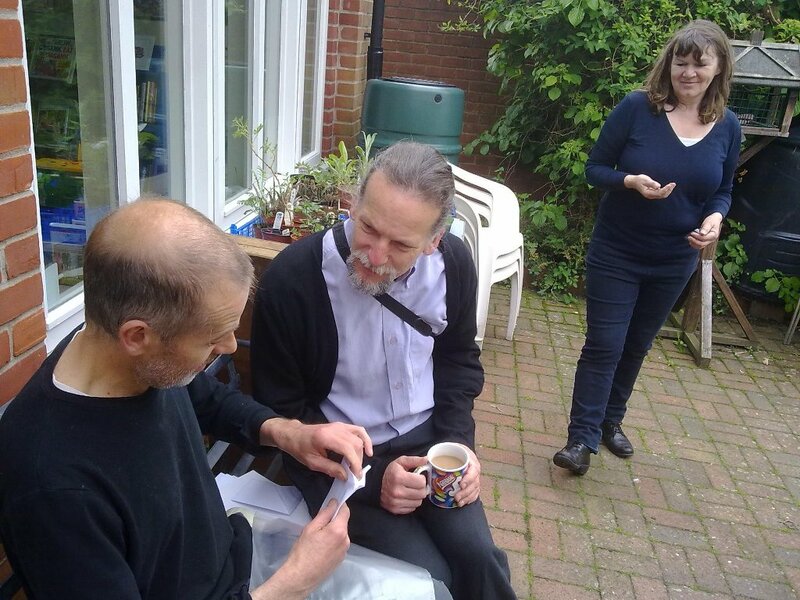 Nick shows Mark how to construct a make-shift seed envelope. 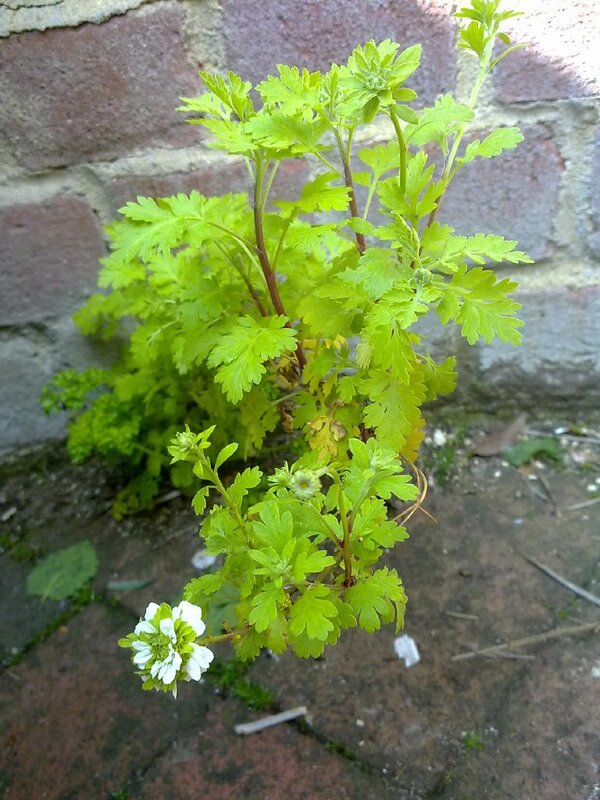 This turned out to be a double (flowered?) version. 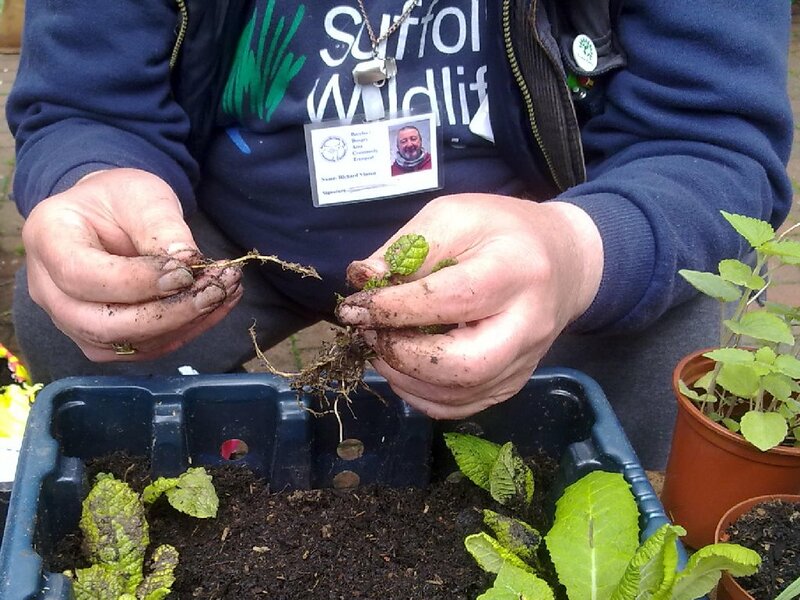 Richard demonstrates how to divide primrose roots and replant them. Primroses respond well to root division and the best time to start is just as the flowers are going over. Here Richard explains that even a small section of root like the one in his hands will resprout, though a misting table is best for roots this size. A new tray of primroses. 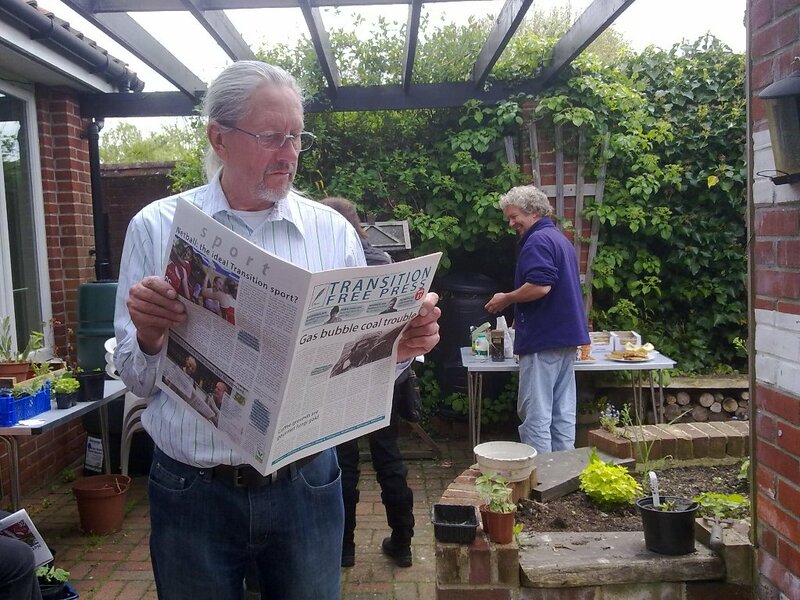 You can’t go to a Give and Grow event anywhere these days without coming across someone reading the Transition Free Press! Tony in deep concentration. And isn’t that the TFP’s editor sitting there with Tony? What a coincidence! Goodness me! Is that ANOTHER copy of Transition Free Press sticking out of Paul’s pocket? Straw bale culture. Cucumber. 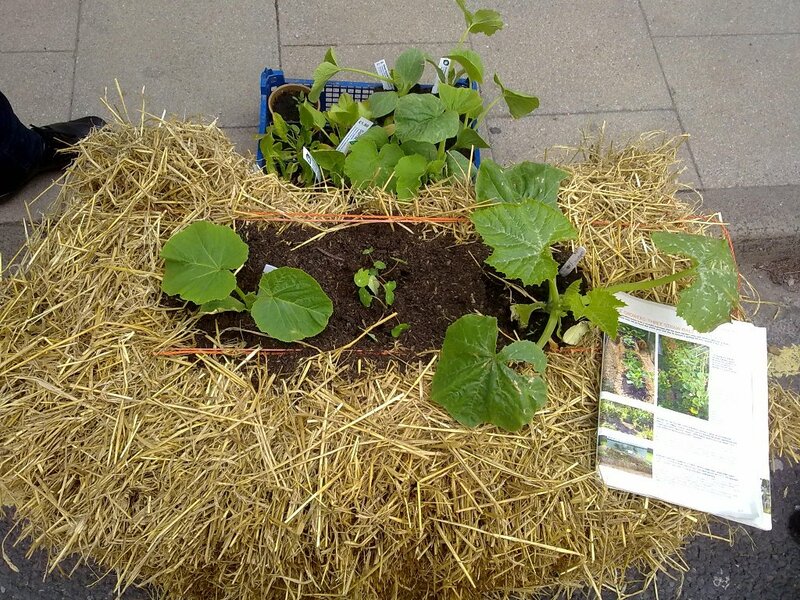 nasturtiums and giant pumpkin planted by Lesley for EastFeast at the Street Garden Market. We’ve now left the library and the Give and Grow and started our well-being walk. No one was in any rush to leave the courtyard garden though, it was so relaxing. We mapped out the route between us deciding to go via the market to the bridge at the bottom of Earsham Street and then down Castle Lane which skirts round the castle ruins. 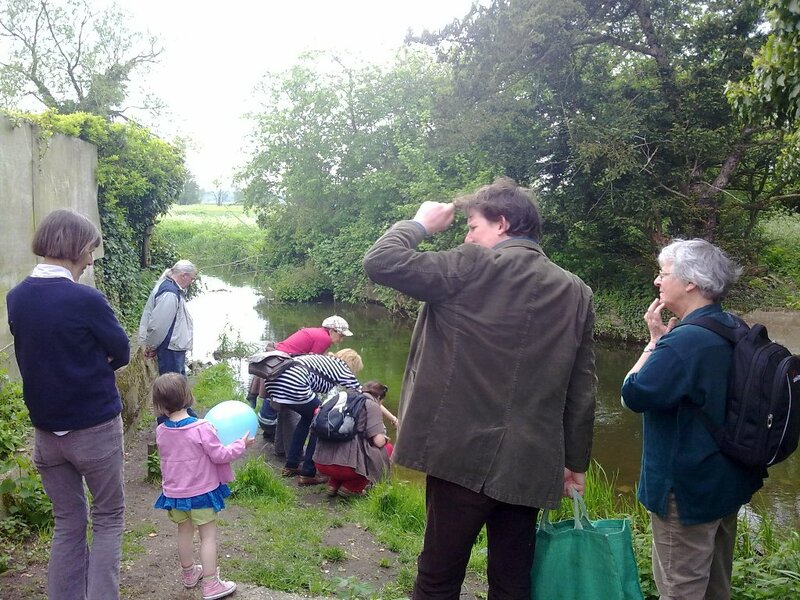 A favourite walk for several people, some found the castle ruins romantic, some liked visiting the wildflowers and others found it an enjoyable route for walking the children to school. 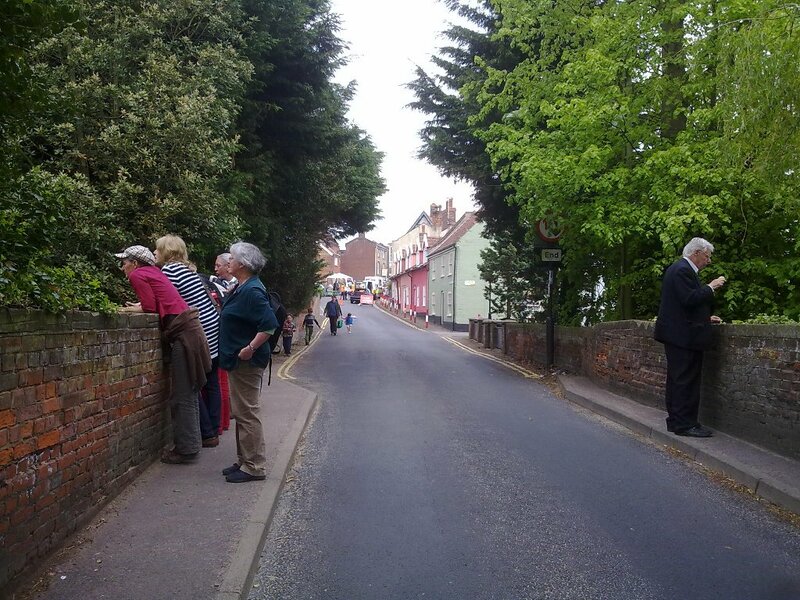 Leaving the market (and the Punch and Judy show) and heading down to Earsham Street bridge and the River Waveney. This is one of Sally’s favourite places to visit. 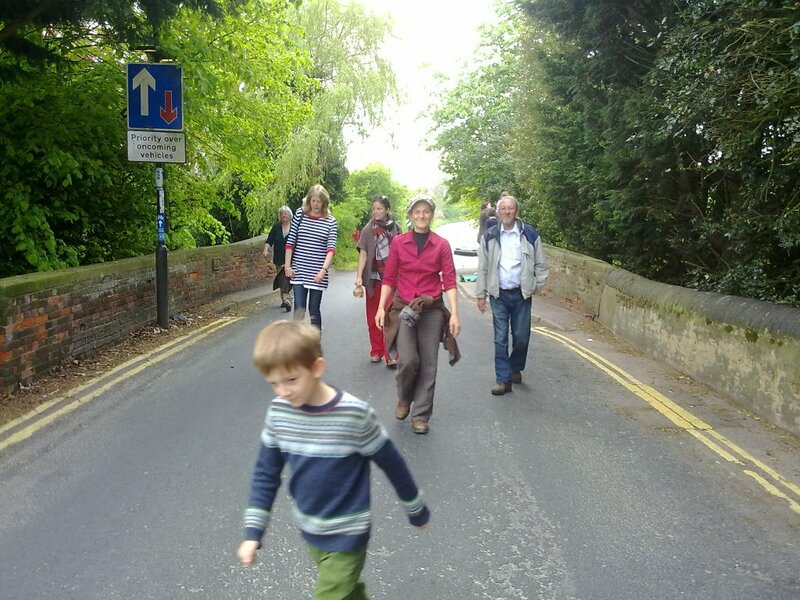 Reuben leads us purposefully to Castle Lane. Take Me To The River, but don’t drop me in the water… at least not until August when we combine our annual picnic with a swim. Back lanes full of wildflowers and garden escapes, from cow parsley and Babington’s poppy to shining cranesbill and grape hyacinth. 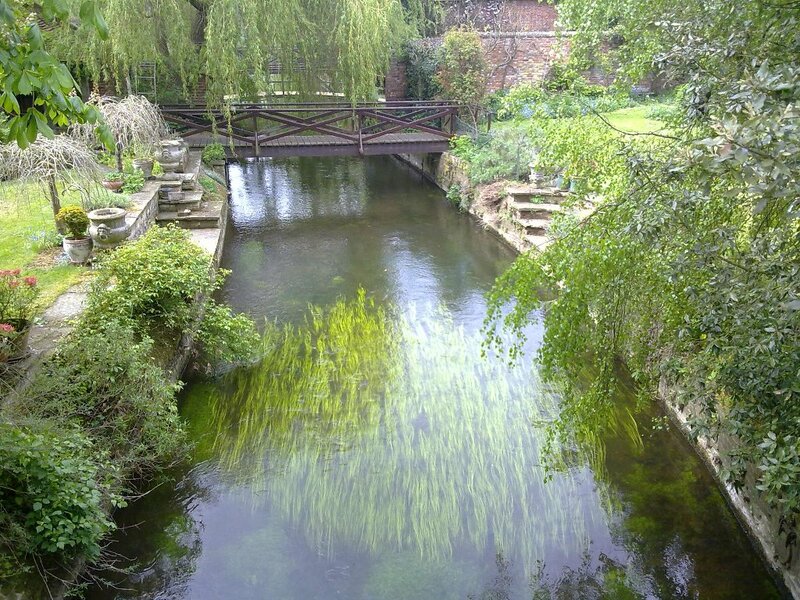 One of Bungay’s delights. 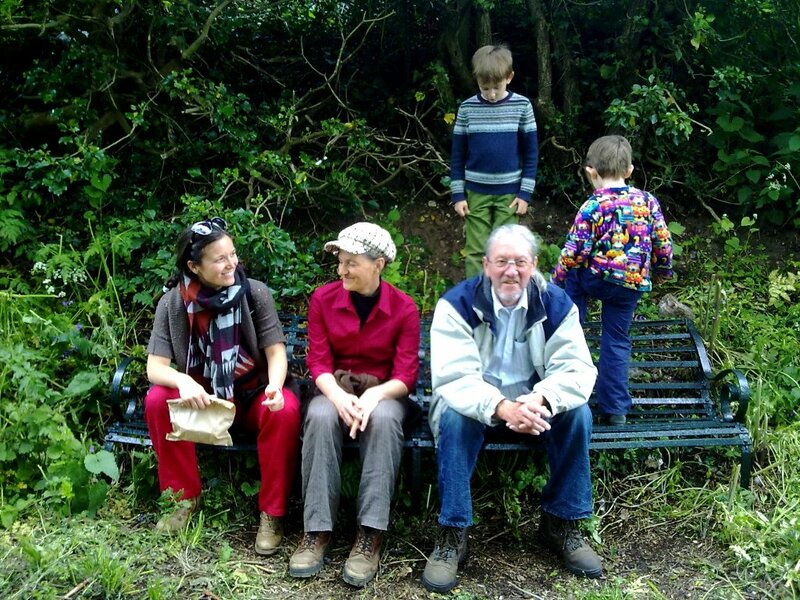 Sitting (and climbing) on the bench, before heading back to Sally’s for a cup of tea. The whole walk was very relaxed and took about an hour and a quarter. 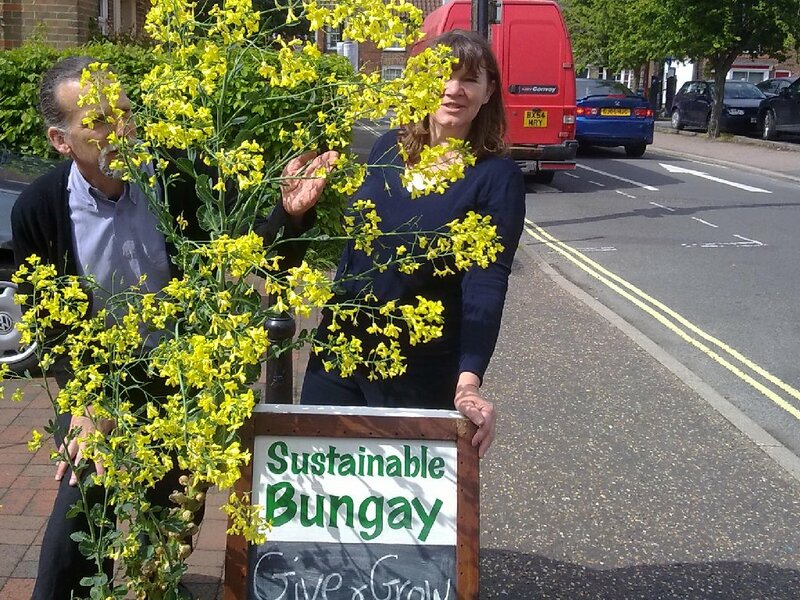 To find out when our next Wellbeing walk is, check out the Sustainable Bungay Calendar – all welcome! 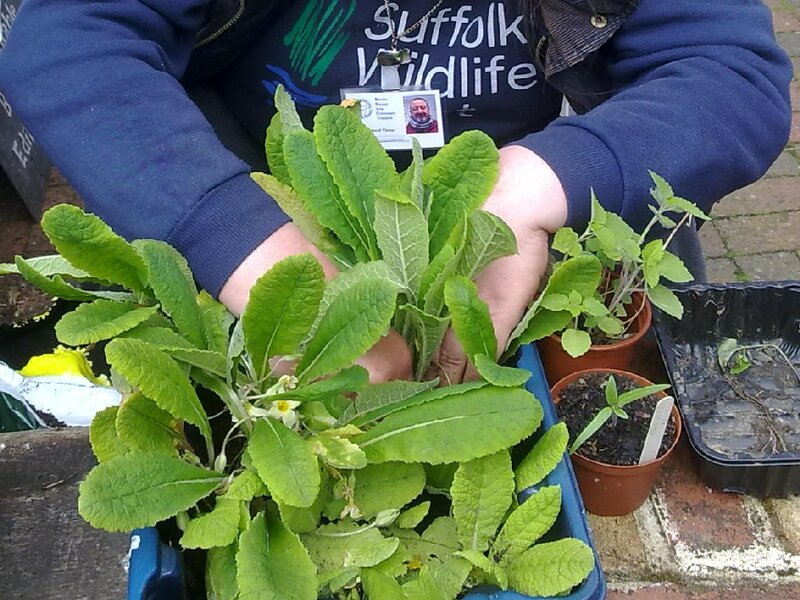 Almost ready for our regular Spring exchange of plants, seeds, seedlings & garden equipment in Bungay Library Courtyard. 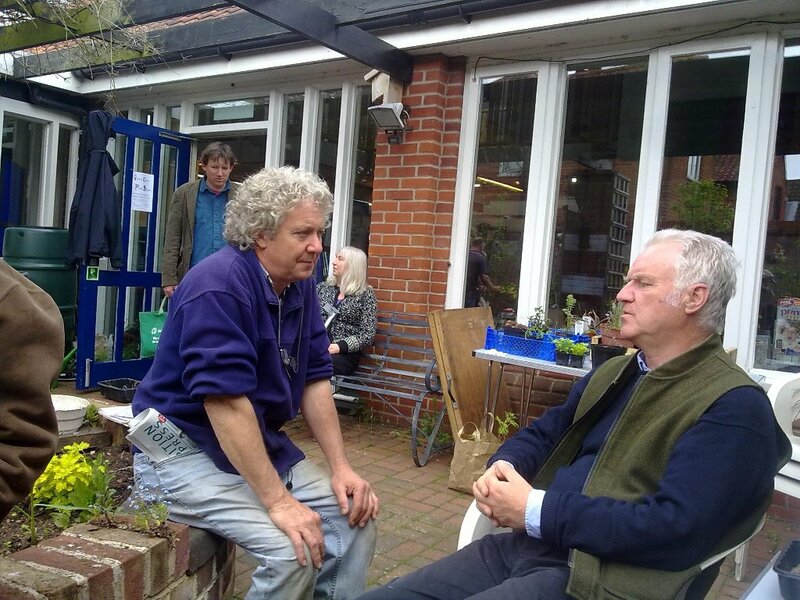 An opportunity to come and meet some fellow gardeners for a chat, a brew and some swapping – all for free! Donations – clearly labelled please – can be dropped off at the library over the preceding days or from 10am on the morning of the event.